Alison has been a board member since 2013 and participated in various volunteer activities since 2010. She has served as a director-at-large, vice-president of operations and as president. She is currently a board member and past-president. She has been committed to managing all challenges that have arisen in her roles. She has also been an active volunteer in running ice shows by acting as a data specialist at competitions, acting as a representative to the Grand River Skating Council, and engaging in fundraising. She has given her personal time to learn more about the club, skating and governance models as she continued to work toward objectives presented in the strategic plan for KWSC. She has helped with welcoming and orienting new skaters as they begin their skating journey. She has received the KWSC Volunteer of the Year Award in 2012, KSA Volunteer Recognition Award in 2014, Jack Coker Award in 2017, and Mark Pstuka Award in 2018. In each of her volunteer roles she has proven her value by contributing both as a leader and a supportive team member. Her knowledge, willingness to contribute and energy have been of great help to the KWSC during her years of service and her ongoing participation. Torsten has been with KMGSA for 8 years coaching our various programs since 2010. He was nominated to the Board as rep convenor in 2014. It didn’t take long to discover Torsten’s strengths and he was soon nominated for the position of president, a position he has held since 2016. Torsten has been a key stakeholder in the partnership with the Blue Chips facility that members utilize to strengthen their fundamentals. He has played a strong part in the player development of our Learn-to-Play and Mini-Mite programs. He has completely revamped our website and played a big role in aligning our budget and financial documentation. One major milestone that Torsten has played a significant part of is the collaboration with the Waterloo Minor Girls Softball Association. We now have a mini joint committee that is working to merge the recreational programs for all of the age brackets. Many things are now standard across both organizations in order to gain parity. Torsten is very well respected by the membership and association. We look forward to Torsten’s continuous growth within the KMGSA. Torsten is very deserving of this award. On behalf of KMGSA, thank you for all of your hard work. The association wouldn’t be where it is today without your dedication. Heather has been with the KW Sertoma Speed Skating Club for 8 years, helping out as a volunteer for the club in various capacities. She joined the executive board two years ago as treasurer. Heather was instrumental in updating our paper accounting to a computer system. This has allowed the board to see financials in real time and make better financial decisions. Heather enabled payment by e-transfer which has been a great improvement for members. She spends many hours completing grant applications, audits and payments. Heather also spends countless hours volunteering in other capacities around the club: pushing mats, fitting skates, and everything in between. Above all, Heather is a proud parent of two speed skaters as well as a hockey player and can be always found rink side supporting our skaters. Thanks Heather! Penny is an extremely committed volunteer. She is supportive of all club activities and gets involved helping anywhere she can. She is a very positive and hardworking individual that people enjoy being around. Her enthusiasm sparks others to get involved. In her time with KWGC, she has been involved in fundraising, hosting events and, in the last year, became a member of the board of directors. At meets, she spends her time out in the cold, directing traffic and greeting visitors. There are many positive comments about Penny and her crew. Last May, the club hosted the Canadian Gymnastic Championships ‑‑ a huge undertaking lasting a week. Penny was one of the first to get involved and took on the task of organizing the Competition Management Office. This involved many hours of preparation and meetings for a year leading up to the event and long days during the event itself. Penny is one of those volunteers that you can count on to take the initiative and do whatever is necessary to get the job done. Louise is a long-time volunteer with our group. She has held the positions of Fundraiser, Registrar and Director of Public Relations. She assists with 10-pin bowling and is a great friend and resource for our athletes. As a fundraiser, she assisted with chocolate bar sales, the silent auction at our annual Christmas party, May Court Flower Basket sales, 5 and 10-pin bowl-a-thons and various one-time projects such as the Manulife Ball Tournament. She is always ready to give parents suggestions for available community services. With a ready hug and a warm smile, she is always welcomes all of our volunteers and athletes. Eleanor Kerr immigrated to Canada from Italy with her mother and brother to join her father in Ottawa. They soon moved and settled in Toronto. She was the first member of her family to go to university. At York University, Glendon Campus, Eleanor majored in English Literature. A career in teaching followed with Eleanor teaching primary and junior grades. She met and married Colm, who later was a founding member of the Waterloo Regional Boxing Academy and moved to Kitchener where they raised two wonderful daughters, Claire and Kathleen. With the girls having started school, Eleanor started teaching French as a Second Language and retired as a grade-four classroom teacher. In 2009, she became involved with WRBA as the corporate secretary. Eleanor’s job involved taking notes for all meetings, keeping board members informed of all club news, etc. and working on different committees in all aspects of WRBA life. In 2018, Eleanor resigned as secretary and continues to support the club in her new position as a director. Dale has been an outstanding member of the organization for the last 10 years. He has completed many things for us; everything from flipping hamburgers at our annual picnic, assisting on deck at every chance he can get, to helping set the pool up for our home swim meets. Dale is a level-2 official with Swim Ontario and he is working on his level 3. Over the last few months, he has taken on the role of meet manager. He has been working with the other clubs coming to our swim meets to ensure that we have the names of all the swimmers and that all are registered for the correct events. Dale always comes to the pool with a smile on his face and a positive attitude. He is willing to take on any task that is required of him. The Urosevic name is almost synonymous with basketball in the KW area. As a player, Alex led St. Jerome’s CSS to an OFSAA Championship, played at Stetson University in Florida and later at the University of Waterloo. He has also represented Canada at the World Student Games, was in the finals of the Toronto 1-on-1 “Cage Match” tournament and is one of the best pure shooters to ever come out of the KW area. As a coach, he has been one of the KW Vipers’ top coaches at every level from U10 to U19 for over the past 16 years. He has coached both boys’ teams and girls’ teams -- often both at the same time. He is a tireless worker, an amazing motivator and one of the best skill teachers around. He is currently coaching the Vipers U10 Novice Girls and the U13 Bantam Boys who are ranked either #1 or #2 in the province depending on the day. Alex has also served on the KWYBA Executive Board for the past 10 years and currently holds the position of Vice-President. Brian has been a dedicated volunteer and supporter of KMHA for more than 25 years. In that time, he has been a coach, a convenor, a team manager, and a director on the board. He has poured countless hours and energy into helping the youth in our community to grow into better people. What is amazing is that Brian achieves all of this while still running several companies and chalking up more frequent-flyer miles than many pilots. Thank-you Brian for all that you do. Aaron Himmelman has served as a volunteer with SkateABLE for four years. First as Treasurer, then as Chair, he has seen the organization through enormous growth. Now operating in eighteen cities across Ontario, Aaron has played a key role in guiding, mentoring, and building a stronger board of directors, while providing support to the Executive Director. This past year, Aaron attended the Manulife Board Bootcamp. He brought back valuable knowledge and key strategies which, when implemented, enabled a province-wide expansion of the SkateABLE program. From his initial involvement as a member of the 50/50 sales team several years ago, Rick has stepped up to take on more and more responsibility and now holds one of the key leadership positions. He has streamlined the paperwork submissions for the draw licences and helped with the implementation of the new electronic draw system. Rick’s willingness to take on additional duties facilitated KSA’s decision to sell 50/50 tickets at the KW Titans home games; Rick does it all from recruiting the sellers, supervising the sales, tabulating the figures right through to processing the paperwork. Due to Rick’s help, KSA now generates more funds for the local minor sports groups. We all are indebted to Rick’s gift of his time and expertise. Ken began his coaching career with Stanley Park when his daughter reached Junior T-Ball age in 1995. He refined his coaching skills with her in Senior T-Ball and Girls’ 3-Pitch before moving on to coach her teams through her years with Kitchener Minor Girls Softball. Several years ago, Ken came back into the Stanley Park Optimist Ball program to help supervise games and work with the umpire crews. Since then, he has also worked registration sessions in the spring and equipment sorting in the fall. Team coaches appreciate his guidance and calming influence. Ken’s value to the program increases each year --- now, we can hardly afford to lose him! You can’t discount Ken’s experience! Meaghan and Kelly work tirelessly day and night to ensure that children of all abilities have the opportunity to participate in the same dance and sport programs as their typically developing peers. They joined the Accessible Sport Committee of the KW Sports Council over two years ago and have been key members since that day. They have served as co-chairs for the past year as well as volunteering their evenings and weekends to share their professional expertise as pediatric therapists with other coaches and instructors attending skill development workshops hosted by the committee. When not participating in committee activities, they can be found at Dance Adventure sharing their love of dance and helping that studio operate a successful inclusion program as well as teaching specialized classes for children and youth with special needs. Brian Woolley has given a lot to KRA over the years, both through coaching and being on the executive. He stepped up when needed and was the head coach of our U16A and U19A teams for several years. He was the Regional Convenor of Kitchener Ringette for many years, then the Rep Convenor for one year. He has helped us run our preparations for the Rep program. Even this year, with his daughter no longer playing, he is an assistant coach helping one of our new coaches of a provincial team. He has been a huge reason for the success and development of KRA and our players. Mark takes on any task KMBA asks of him and does it with creativity, professionalism and love for community and baseball. Mark has been head coach of house league, select and rep teams. This season, he raised his squad from the ICBA Tier 2 to Tier 1 loop and did so with very respectable results. He was then selected to be one of the founding members of the new KMBA board structure where he has given his informed perspective on some serious topics such as development of all ages and levels of skill. Mark chairs our 8-18 Pipeline Committee that has done a great job preparing players for fall tryouts and providing players with more development time. Mark is one of the faces of KMBA at the grassroots level and is the perfect example of a volunteer that serves to improve our baseball community. He is always around to help coaches when they need it. From enrolling in tournaments in January, to pitching strategies, to stat tracking tools, Mark was always willing to help and share his knowledge. During the winter, when Mark's Tier 2 team was running practices on Friday nights, Mark invited additional players from Tier 1 and the development team so more players could grow and improve their skills. His players, parents and other coaches really respect him and his approach to coaching. He is fair, calm and gets the best from his players. He makes a great role model for other coaches. Daniel has been a volunteer with Track 3 since 2004. He exemplifies our organization’s philosophy of providing high quality learn-to-ski instruction for children with disabilities. Participants under Daniel’s direction have had the opportunity to experience success in a way they never thought possible. Daniel’s attitude is contagious! He has been a tremendous asset to our program and can always be counted on to help out wherever and whenever needed. We all thank Daniel for making a huge difference to so many children’s lives and to the success of the Track 3 program over the years. Marlene has served on the board of The Kitchener Rangers Hockey Club for the past 18 years. Along with fulfilling her responsibilities as a director, Marlene has volunteered at the Labour Day Weekend Fan Appreciation BBQs, Hockey Day in Ranger Nation, Ranger golf tournaments and the 2008 Memorial Cup Tournament. Outside the Ranger organization, Marlene volunteered at ISC World Fast Pitch 2006, 2007 and 2014 Tournaments, Special Hockey International 3-day Tournament 2013 and fundraises for minor hockey. Marlene and her husband, Ron, have held the Baden Car Show and 50/50 sales for 9 years with all the proceeds donated to the Children’s Wish Program. The two have also organized the Annual Father’s Day Breakfast and Car Show in Petersburg for the past 10 Years with all the proceeds going to the Petersburg Optimist Club to assist children with cancer, childhood diabetes, etc. Her 18 years of volunteer work for different organizations more than qualify her as the Kitchener Rangers Volunteer of the Year for 2018. KWMBSA’s KSA 2018 Volunteer is Elizabeth Baker. Liz started out as a ball parent and now serves as a team score keeper and team manager. She was elected on to our Board of Directors where she currently sits in the role of treasurer. Over the years, we seem to lose our secretary so she steps up to fill this position as well. She’s married to one of our rep coaches and a mother of three boys who have come up through our system --- all of whom have helped in many capacities throughout the years. Liz also has a daughter who played KMGSA ball and umpired with all her brothers in our league. (Liz also volunteered with her daughters’ teams over the years.) Her kids are very active and busy and play multiple sports and yes, she is always there helping in some way. Liz keeps KWMBSA in the black by doing our books and keeping our president informed and aware of all the necessary figures. With her in these positions, the board is always well notified and well informed in all aspects of the operation. You can always find Liz at the diamonds involved in something with her team, helping out at our concession, handing out medallions and trophies, walking around delivering newsletters or discussing items with coaches and parents. She helps out and schedules people for our bingos and is always at other functions the league partakes in. These and many, many other reasons are why KWMBSA is pleased and honoured to have Liz Baker as our 2018 KSA Volunteer award recipient. We thank Liz for her many years of service and … many more we hope! Dan Dawson has been volunteering with Waterloo Ringette since 2003 when his daughter Jessica started playing the sport. At that time, Dan recognized the potential of ringette. He immediately started learning more about the game, assisted with on-ice practices and has been an assistant or head coach every year since then. Dan is currently the head coach of one of Waterloo Ringette’s Open 18+ teams, a position he has held since 2012. During his tenure of coaching, his team has placed in the top 3 within Ontario several times and has moved onto the Eastern Canada Championships twice, both times winning the champion title. In addition to being a role-model coach, Dan has been an outstanding volunteer with Waterloo Ringette. Dan has been a member of the board for 7 years including a term as President. His volunteering also extends outside our local community; Dan has served as Vice-President of Western Ontario Ringette League for 5 years. He has made numerous contributions to the development and governance of the sport within our region and our association. Waterloo Ringette plans, organizes and executes many annual events that enable the association to promote the sport, develop player skills and build a rewarding culture. Two of these events are the Winterfest and Provincial Championships tournaments. Dan has been a highly respected and valued member on the Winterfest tournament committee for over 15 years and on the Provincial Championship Committee 6 times. Dan’s dedication, passion and enthusiasm are ever-present in everything he does. Over the years, Dan has been guided by his philosophy that, “To make an impact on a player and their ability to enjoy a sport, while improving their skill, is what makes it all worthwhile”. Dan has always been a motivational coach to the players, an inspiration to volunteers and a guiding light to those who follow him in Waterloo Ringette. Seven years ago when she first signed up her son to play football, Kelley probably had no idea it would impact her life so much. After a couple of seasons, she was hooked and decided that she wanted to do more to support this volunteer-run organization so she became a member of the Board of Directors. Over the next five years, she wore many different hats: registrar, treasurer and secretary. Kelley was willing to step in where ever there was need, even when there was a steep learning curve. In January 2018, she decided that she would step down from her position on the board to focus on a better life balance. Usually, this would mean you would never hear from the volunteer again, but that wasn’t the case with Kelley. It was like letting go of her board position freed her up to volunteer more! This year she was team photographer for two teams, fundraiser extraordinaire, team party planner, spirit wear marketer and even assistant manager. It was like she never left the football field between April and July! As you can see, Kelley is a valued and important member of our organization and has contributed greatly to our success. Thank you Kelley for all that you have done and continue to do. One of the KW Predators Volleyball Club’s most effective and invaluable coaches is Lisa Watson. She has coached with the Predators for over 10 years and has been heavily involved with our beach and skills camp programs. This local involvement has carried over provincially as she has also worked extensively with the Ontario Volleyball Association at their high performance camps, specialty skills camps and beach programs. Most impressively, last year her girls’ Synergy team won both the Provincial and National Volleyball Championships! Lisa was also named the OVA Female Developmental Coach of the Year. As if this wasn’t enough, she found the time to involve her team in the ‘Stuffin’ Stockings Charity over Christmas. As a high school teacher, she has coached both boys and girls Forest Heights volleyball and soccer teams. In addition, she has taken on administrative roles, most importantly being CWOSSA convenor for both boys and girls volleyball for a number of years. 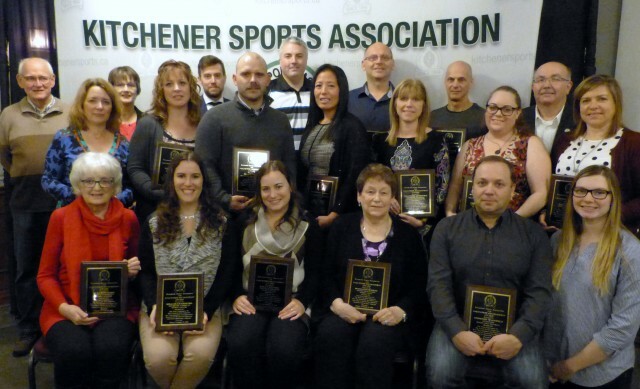 In a time of diminishing numbers of volunteer coaches in all sports, Lisa is an outstanding example of long-term excellent involvement in working with the youth of our area and our province. We are proud to name her our Volunteer of the Year. Trevor stepped up this year by putting his name forward to coach our U11 program. He brought with him 20 years of rugby experience; he’s played all over Ontario and on a scholarship for Colorado State University. Trevor brought with him renewed vigor for our Minis program, a deep knowledge of the game, and endless energy. Thanks to Trevor, for the first time ever, one of our minor teams was given the opportunity to play a scrimmage during the half time break of a professional rugby game. Trevor has shared his love for rugby with the kids and, to date, has mentored three new coaches to our system. Lastly, Trevor has started a new project with our veteran coaches; he’s the chairperson for a U13 tour to Wales in 2020. With 30 kids traveling overseas, Trevor is a truly brave man! We are very pleased to have Trevor helping at WCRFC. On behalf of KSA members and the local sports groups, KSA President Bill Pegg presented Norm Foss with a special KSA President's Award in recognition of Norm's service to KSA (and thereby the local minor sports groups) for the past 40 or so years. Norm has done it all: past-president, director, member of the Operating Committee, 50/50 Co-chair, bookkeeper and treasurer. He's done all the financial reporting and year-end statements and plans to take a step back. On behalf of the local sports community, we extend our sincere thanks to Norm for everything he's done -- but we'll still see him at the next board meetings!